An example from Flanders of how rural development funding (Measure 331 - Training and Information) can be used to promote even the most technologically-advanced forms of agriculture and horticulture. Flemish agriculture and horticulture is highly professional and focused upon the production of high-quality goods offered at competitive prices. Many up-to-date advances in technology are increasingly used to achieve this, including modern satellite technology. Satellite data is available to farmers and growers in Flanders to closely monitor soil fertility, crop growth and yield, but there is an on-going need for specialist advisory support to help farmers to process and apply this data. The project aimed to support farmers and growers in the Flemish province of Limburg with the application of modern satellite technology to the management of their crop production systems. 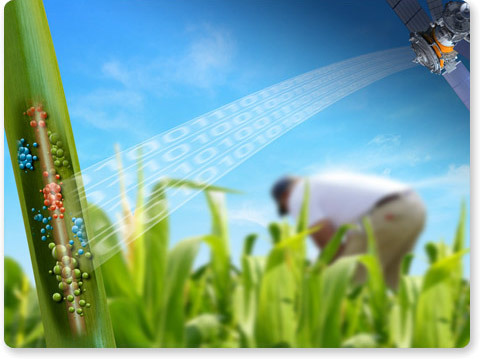 This involved the use of specialist software that integrates satellite images and various crop production parameters (e.g. crop growth stage, soil moisture content, nitrogen levels and yield) ready for linking to GPS-controlled fertiliser spreading systems etc. Farmers visited a dedicated website (www.mijnakker.be) during each week of the growing season from April to October (if cloud cover permits) to obtain regularly updated information on the growth status of their crops. This provided very precise (10 x 10 metre plot) information on crop growth that was generated using a combination of satellite and weather data. Farmers could then adjust crop management in order to optimise yield and overcome variations in soil fertility etc. within their fields. Advice was offered free of charge to farmers for the duration of the project. The system was available for all crops and formed the basis for further advisory support and practical management actions. This eliminated the need for the collection of crop samples and expensive laboratory analyses. Agrivisie, Limburg's agricultural knowledge centre, was established in 2008 with the purpose of promoting innnovative new projects for sustainable, economically viable agriculture in the Province. The 'Advice from Space’ project demonstrates very nicely how rural development funding can be used to promote even the most technologically-advanced forms of agriculture and horticulture.